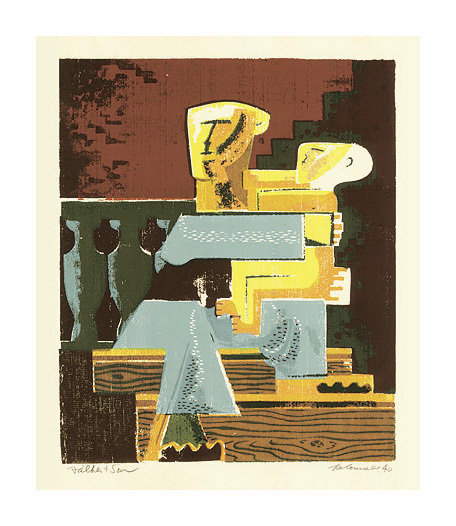 Father & Son = 1940, Color Serigraph. Edition c. 35. Signed, dated, and titled in pencil. Annotated 35 in pencil, bottom right margin. Image size 12 x 10 inches (305 x 254 mm); sheet size 19 1/8 x 12 1/2 inches (486 x 318 mm). 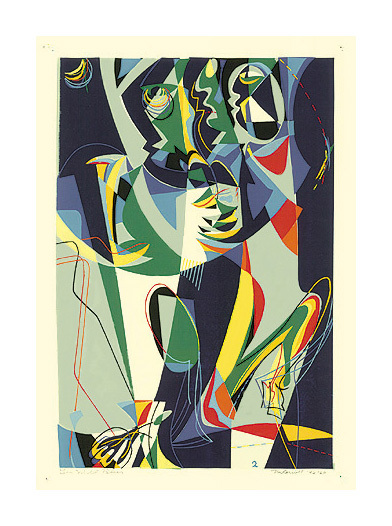 A fine impression, with fresh colors, on cream wove paper, with full margins (1 1/16 to 3 7/8 inches). Tape stains in the sheet edges, verso, otherwise in excellent condition. 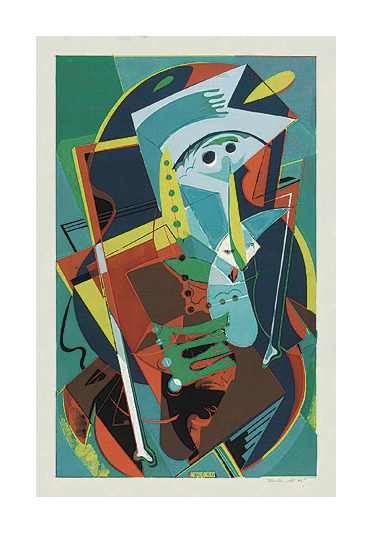 Big Blue = 1945-46, Color Serigraph. Edition c.30. Signed and dated '45 in pencil. Titled in pencil, bottom left sheet edge. Signed McC and dated '46 in the screen, bottom center. Image size 18 1/8 x 11 3/16 inches (460 x 284 mm); sheet size 22 x 14 inches (559 x 356 mm). A fine impression, with fresh colors, on heavy, off-white bristol, with full margins (1 1/4 to 2 inches). Minor pale staining and surface soiling in the margins, not affecting the image, otherwise in excellent condition. 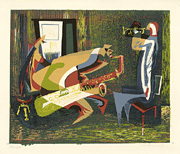 Gin Mill Blues =1946, Color Serigraph. Edition c. 20. Signed, dated, titled, and annotated 20 in pencil. Image size 13 7/16 x 9 1/16 inches (341 x 230 mm); sheet size 19 1/4 x 12 1/4 inches (489 x 311 mm). A fine impression, with fresh colors, on cream wove paper, with full margins (1 1/2 to 3 inches), in excellent condition. 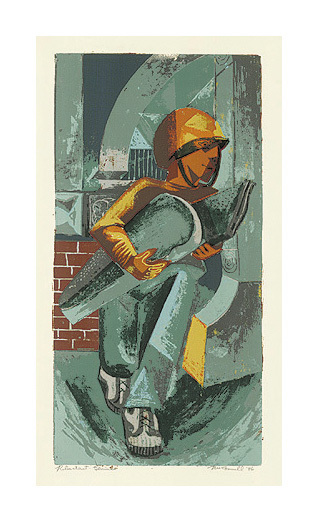 Reluctant Genius =1946, Color Serigraph. Edition c. 30. Signed, dated, and titled in pencil. Image size 14 x 7 inches (356 x 178 mm); sheet size 17 x 11 inches (432 x 279 mm). A rich, painterly impression, with fresh colors, on heavy cream wove paper, with full margins (7/8 to 2 inches). Minor skinning in the top, left, and right sheet edges, verso, not affecting the image; otherwise in excellent condition. 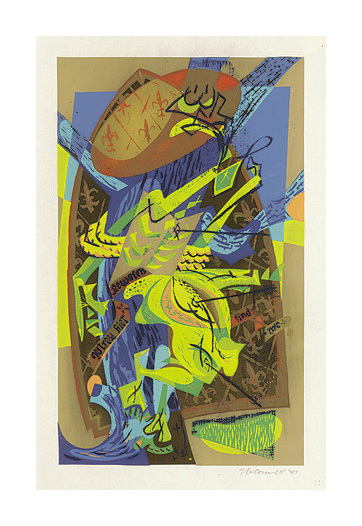 St. Sebastian =1947, Color Serigraph. Edition 30. Signed and dated in pencil. Stamped JAMES H. McCONNELL - RT. 1, BOX 298 - LAINGSBURG, MICHIGAN, in the bottom left margin. Image size 10 3/16 x 6 1/8 inches (259 x 156 mm); sheet size 14 1/4 x 11 1/4 inches (362 x 286 mm). A fine impression, with fresh colors, on buff wove paper, with full margins (1 9/16 to 2 5/8 inches). Tape stain in the top center sheet edge, recto, otherwise in excellent condition. Sister Kate = 1947, Color Serigraph. Edition 24. Signed, dated, titled, and numbered 24 in pencil. Annotated 10.00 - 19 colors - 24 copies - #24 in pencil. Image size 8 5/8 x 14 1/16 inches (219 x 357 mm); sheet size 11 1/16 x 15 1/2 inches (281 x 393 mm). A fine impression, with fresh colors, on heavy tan wove paper, with full margins (11/16 to 1 1/2 inches). Tack holes in the four margin corners, well away from the image, otherwise in excellent condition. 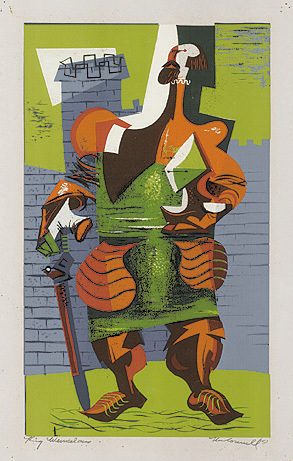 Rex = 1950, Color Serigraph. Edition c. 20. Signed and titled in pencil. Signed and dated in the screen, lower right. Image size 10 3/16 x 15 7/8 inches (256 x 403 mm); sheet size 12 x 19 1/16 inches (305 x 484 mm). A fine impression, with fresh colors, on heavy cream wove paper, with full margins (7/8 to 2 1/4 inches). Brown paper tape remains in the top left and right sheet corners, recto, otherwise in excellent condition. 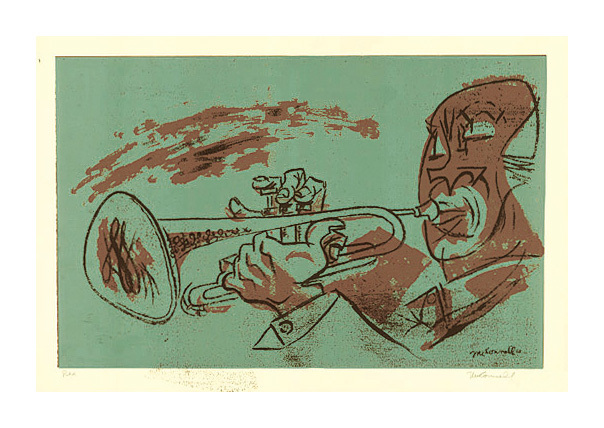 Portrait of the jazz cornet player Rex Stewart. Combo = c.1950, Color Serigraph. Edition c. 20. Signed and titled in pencil. Stamped METZGER GALLERY - 38 WEST 57 ST., N. Y. 19, top left sheet corner, verso. Annotated Combo - McConnell - Ed. 20 - Pr 25 in pencil, top right corner, verso. Image size 9 1/8 x 10 15/16 inches (232 x 278 mm); sheet size 11 7/8 x 14 inches (302 x 356 mm). A rich, painterly impression, with fresh colors, on cream wove paper, with full margins (1 3/8 to 1 5/8 inches). Skinning in the top, left, and right sheet edges, recto, well away from the image; otherwise in excellent condition. 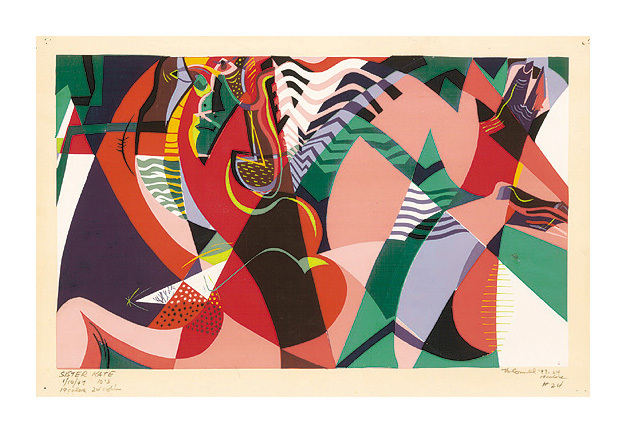 Irene Irene = 1951, Color Serigraph. Edition c. 20. Signed, dated, and titled in yellow pencil. Image size 9 x 6 1/16 inches (229 x 154 mm); sheet size 11 1/2 x 8 3/4 inches (292 x 222 mm). 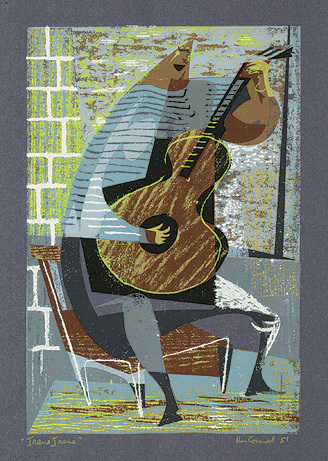 A rich, painterly impression, with fresh colors, on heavy dark blue wove paper, with full margins (1 1/8 to 1 3/8 inches). Brown paper tape hinge remains in the top left and right sheet corners, otherwise in excellent condition. King Wenceslas = 1951, Color Serigraph. Edition c. 20. Signed, dated, and titled King Weincelaus in pencil. Annotated KING WENCELAUS - McCONNELL - Ed 30 - 25.00 in pencil, in the top right corner, verso. Image size 13 1/8 x 7 13/16 inches (333 x 198 mm); sheet size 17 1/2 x 11 1/2 inches (441 x 292 mm). A fine impression, with fresh colors, on heavy gray wove paper, with full margins (1 5/8 to 2 5/8 inches). Skinning in the top left and right sheet corners, recto, well away from the image, otherwise in excellent condition.